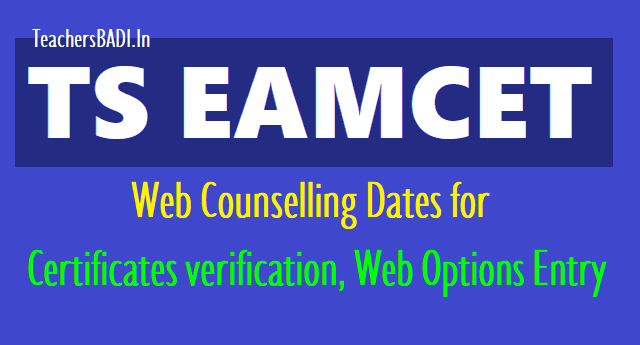 2nd phase TS EAMCET Web counselling dates for Certificates verification, Web Options Entry 2019: TS EAMCET 2019 Counselling, List of documents, Important dates and how to apply on Online : TS EAMCET Counselling 2019: The results for the Telangana State Engineering, Agriculture & Medical Common Entrance Test (TS EAMCET) were released on May 19, 2019, by the School and Mass Education Minister Badri Narayan Patra. The successful candidates can now take admission into BE, BTech/BTech (Bio-Tech)/BTech (diary technology)/BTech (Ag. engineering)/BPharmacy/BTech (food technology (FT))/BSc (Hons) agriculture/BSc (Hons) horticulture/BSc (forestry)/BVSc and AH/BFSc and Pharm-D courses. The eligible and qualified candidates of TSEAMCET-2019 who have not attended for Certificate Verification earlier shall get their Certificates verified from designated Help Line Centers mentioned in Annexure I. The candidates who have participated in first and second Phases Counselling can also exercise options using their old password, Login ID for the left over seats now available and consequential vacancies that may arise in the process of allotment as per the schedule given below, and it is advised to exercise options for interested Colleges assuming that vacancies are available in the course of their choice. Candidates who had qualified in TSEAMCET-2019 and who secured 45% (for OC) and 40% (for others) in group subjects of intermediate or its equivalent examination. ఇంజినీరింగ్ రెండో విడత కౌన్సెలింగ్ షెడ్యూల్‌ను అధికారులు విడుదల చేశారు. జులై .. వరకు ఆన్‌లైన్ రిజిస్ట్రేషన్ల ప్రక్రియ ప్రారంభంకానుంది. జులై .. తేదీల్లో ఇంజినీరింగ్ అభ్యర్థుల ధ్రువపత్రాల పరిశీలన ఉంటుంది. జులై .. వరకు వెబ్ ఆప్షన్ల నమోదుకు అవకాశం కల్పించారు. జులై ..న ఇంజినీరింగ్ రెండో విడత సీట్ల కేటాయింపు ఉంటుంది. రెండో విడతలో 26,241 ఇంజినీరింగ్ సీట్లు అందుబాటులో ఉన్నాయి. మొదటి విడత కౌన్సెలింగ్ తరువాత భారీగా సీట్లు మిగిలిపోయాయి. The Telangana State Council of Higher Education (TSCHE) has announced the dates for the 2nd round of counselling which will be conducted from july 6 to 12, 2019. The engineering classes will begin from July 16. The online filing of basic information and payment of processing fee will start from July 6 and will continue till to July 8. The verification of certificates will be done from July 7 to 8 and candidates will be able to avail choice of web options from July 7 to 10. The provisional allotment of seats will begin on July 12. 5. Tuition Fee Payment and Reporting to Collges: July .. The Telangana State Council of Higher Education (TSCHE) has announced the dates for the first round of counselling which will be conducted from May .., 2019. The engineering classes will begin from July ... As per reports, Navin Mittal, Commissioner of Technical Education said online filing of basic information and payment of processing fee will start from May .. and will continue till to June 2. The verification of certificates will be done from May .. and candidates will be able to avail choice of web options from May 28 to June 5. The provisional allotment of seats will begin on June 8. The exam was conducted by Jawaharlal Nehru Technological University (JNTU), Hyderabad on behalf of TSCHE. A total of 2,20,990 students had applied for the exam out of which 2,03,168 students appeared for the same. 2. Verification of documents- May .. to June ..
3. Choice filling form- May .. to June ..
Out of 1,36,305 candidates in engineering stream, a total of 1,06,646 have qualified. In agriculture, pharmacy and allied groups, out of 66,858 candidates who had appeared, a total of 60,651 have passed. 1. Online filing of basic information and payment of processing fee: May..